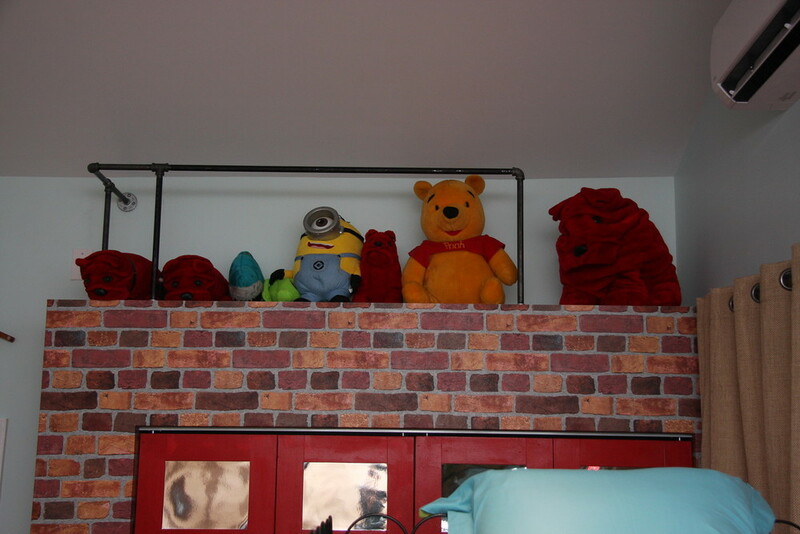 Special rooms designed for special children. We cannot create these Corner Kingdoms without the help of our amazing volunteers and sponsors! 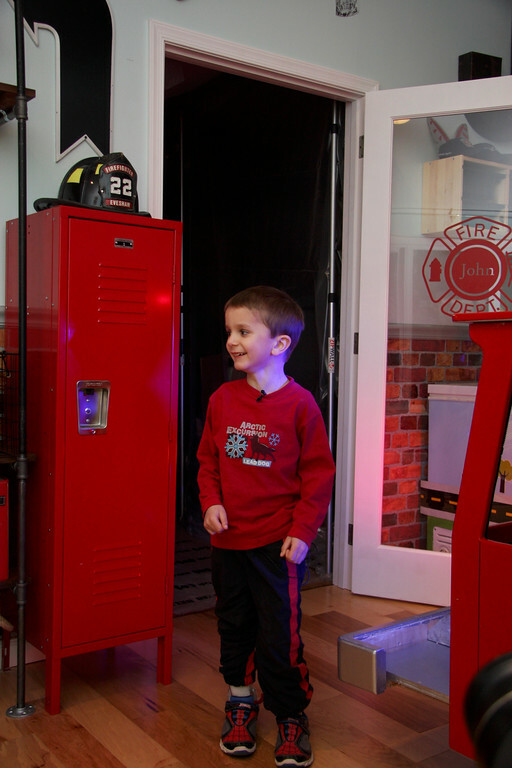 “John John” is an energetic 5-year-old who wants to be a firefighter when he grows up. John was diagnosed with Stage 4 anaplastic ganglioglioma in 2013. This is an aggressive, malignant tumor in his brain. Last year, the doctors told his parents he had three to nine months to live. But John John is a fighter. He fights fires AND cancer! 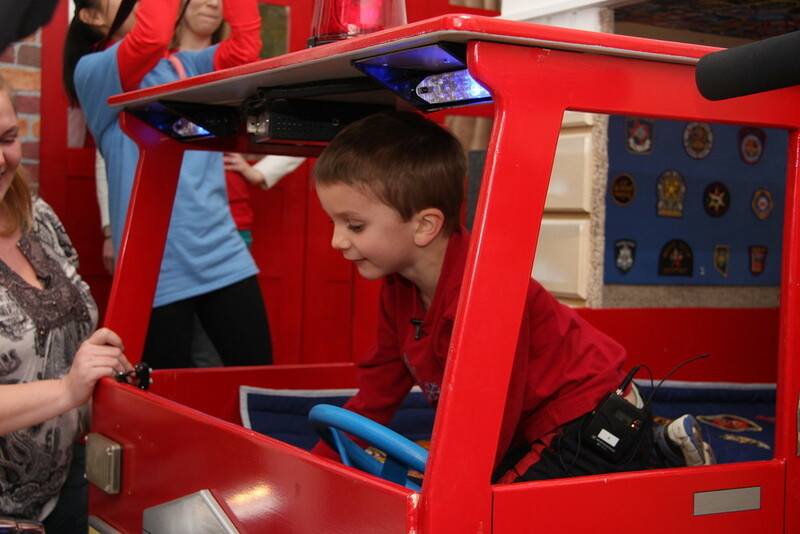 On the weekend of March 28th, 2015, Corner Kingdoms united with Evesham Fire Rescue and BELFOR Restoration to build John's Dream Firefighter room. We raised almost $11,000 and over 50 volunteers showed up to make this project a huge success! To see the full story, volunteer build event, and list of sponsors click here. Dream Bunk Bed Design Come to Life! 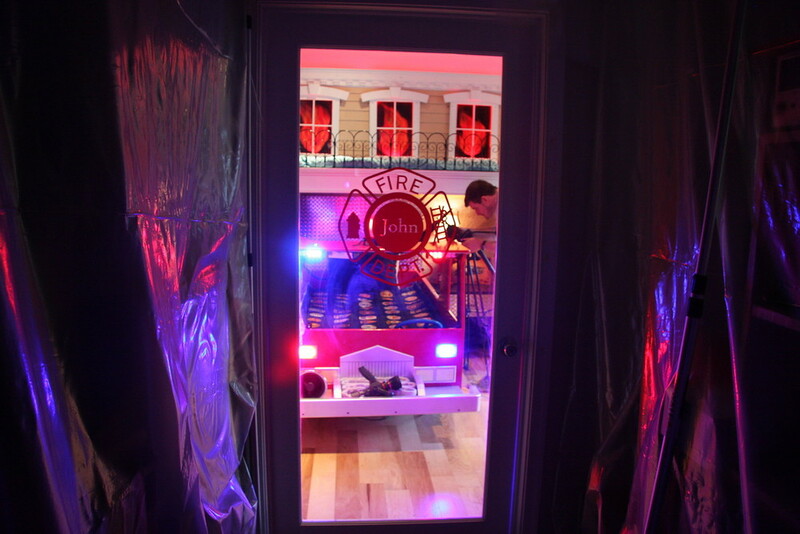 Firehose, working lights, and siren! It's the real deal! When John goes to the hospital, he can bring this quilt as a reminder of all the people supporting his fight! When John looks up and around, he can see how many people are supporting him. 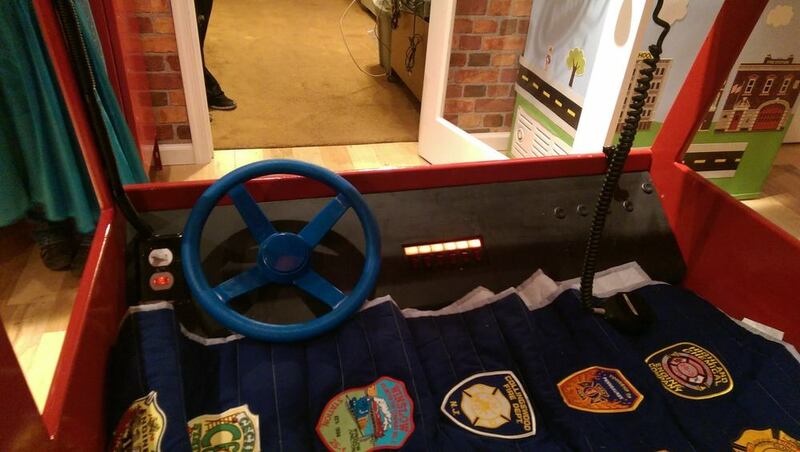 John requested a slide be attached to his dream bunk bed. After he saves the day, he can slide to safety! These windows are remote-operated to flicker, glow, and fade in all colors. The idea was to have the house really look like it's on fire! 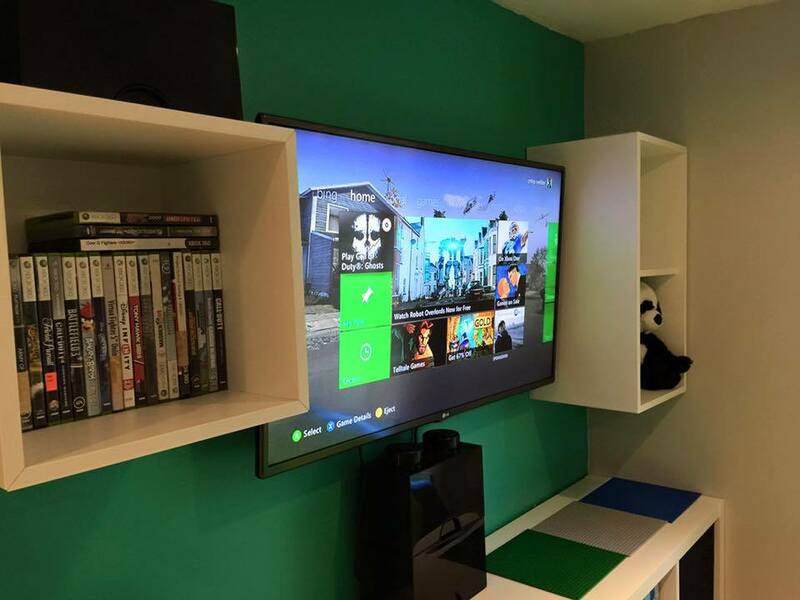 Maximizing storage was a main goal in this design. The freezer needed to remain in the room. 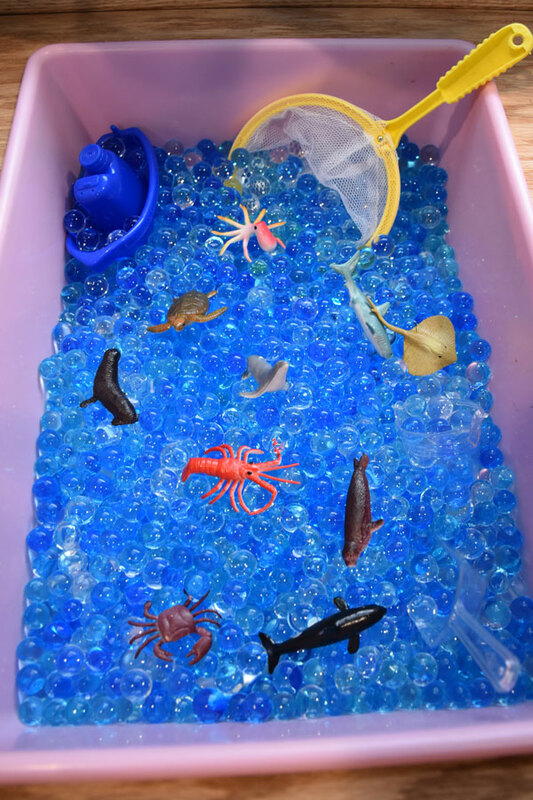 I wanted to make it fun and functional, so we adhered vinyl and made it a giant magnetic-play scene! 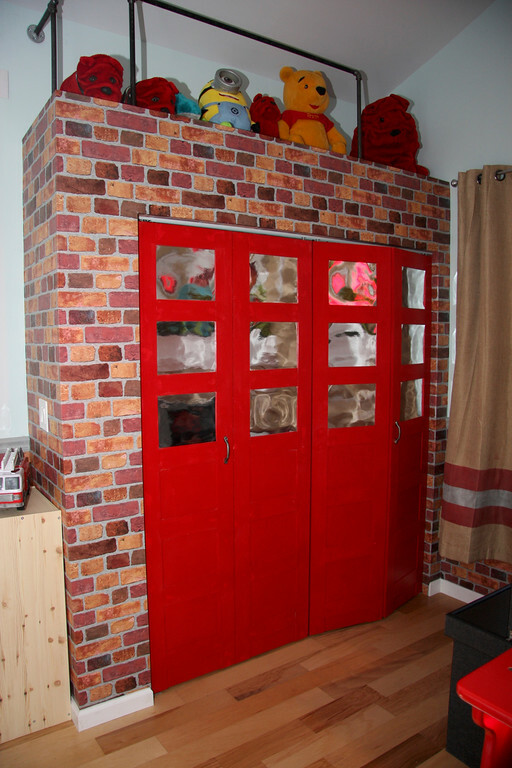 The bi-fold doors were decorated to resemble the garage bay doors at the fire house. Curtains resemble the bottom of a fire jacket. Custom slanted desk by Rockland Custom Cabinets. These are what captains use in their vehicles while managing the emergency scene! This FD signed this seriously cool ax and sent it to John for his room! This prayer emblem is the original that hung at the Willingboro Firehouse on Sunset Rd. 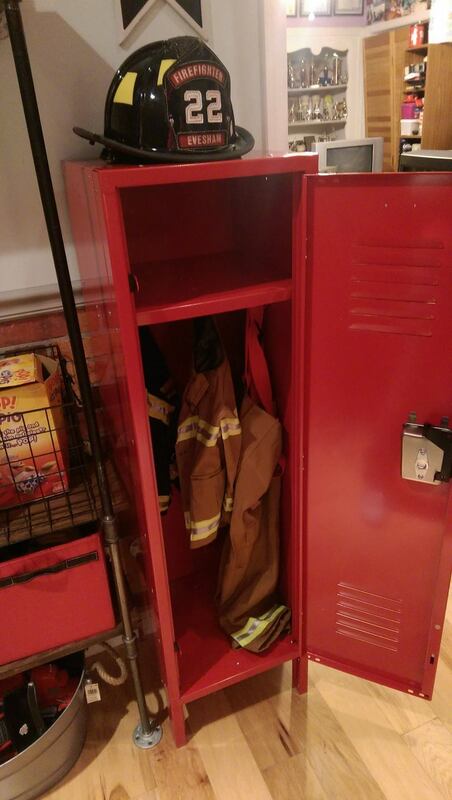 The firehouse was recently closed and members donated memorbilia to the project. 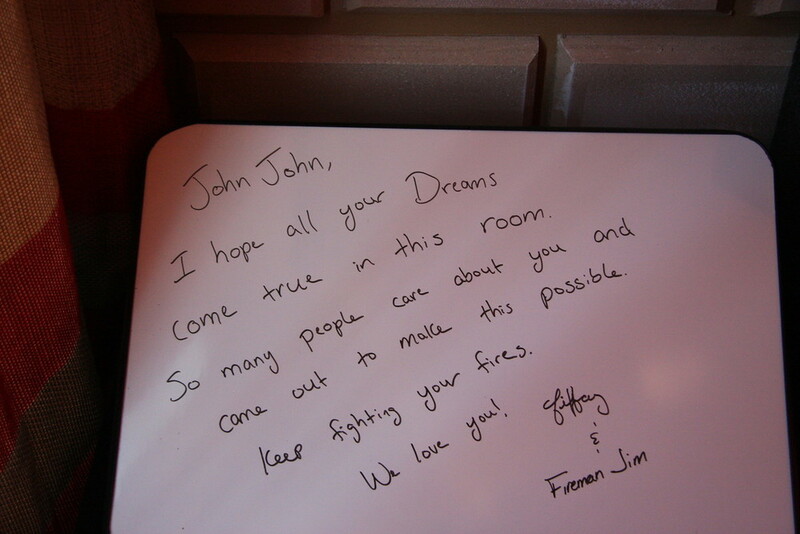 The first thing John sees is his name on the door of his very home Fire Department. Hope and John are inseparable best friends. Hope is John Marandola's sister, best friend, and support system. 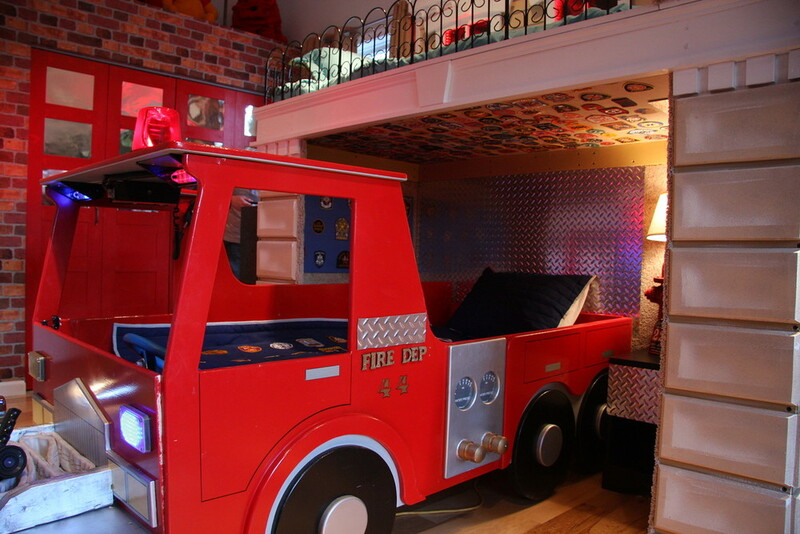 When Evesham FD reached out to nominate John, they also requested that Hope get a mini-room-makeover as well. 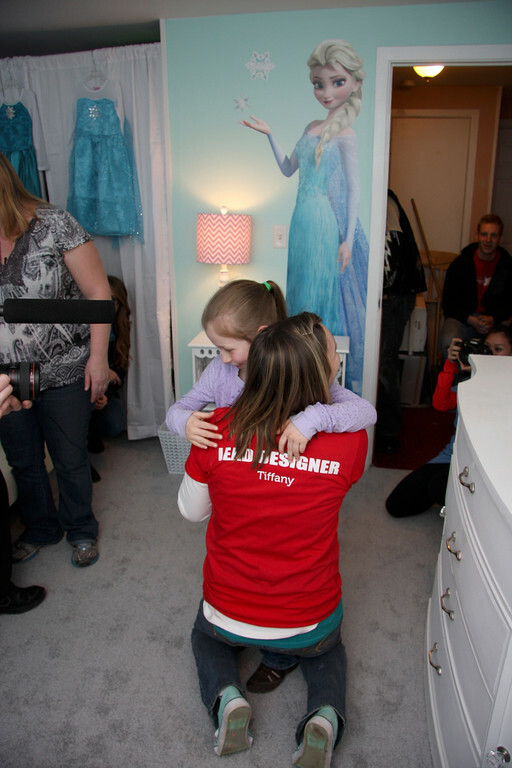 Volunteers and donors came together to give Hope a full Princess Dream Room which was created during the same Big Build Weekend Event. 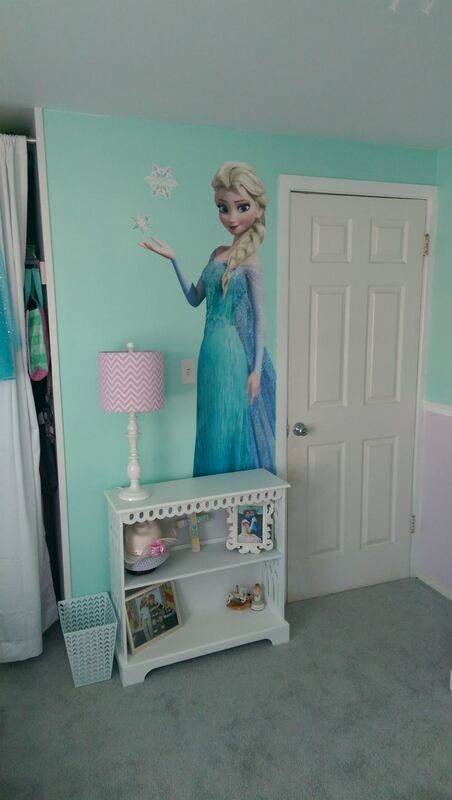 Hope told me she loved the color teal, and her favorite princess is Elsa. Hope also loves butterflies. The room originally had two twin size beds because John needs to sleep with Hope nearby. 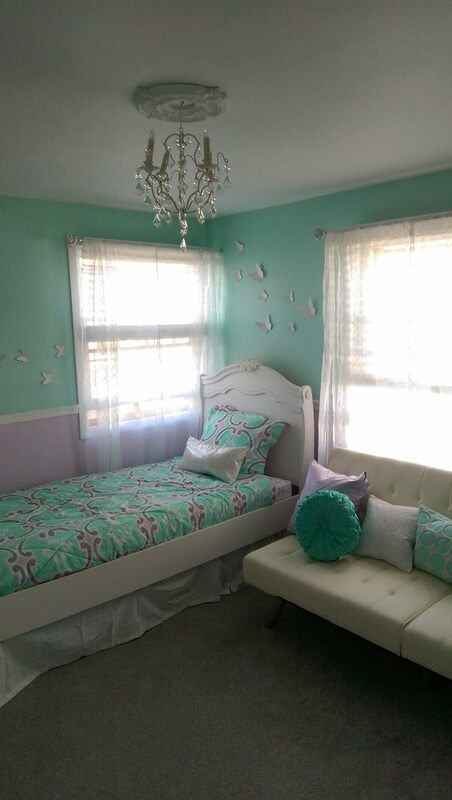 I wanted to make sure this room was "Hope's space", so a princess futon will fit John's needs and not take up too much space in the room. Hope can also use it for future sleepovers with her friends! 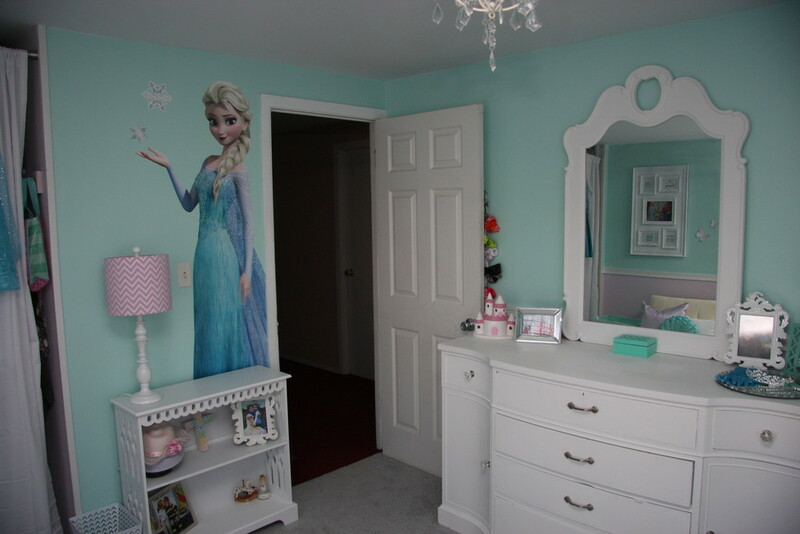 Hope requested a mirror for her room. 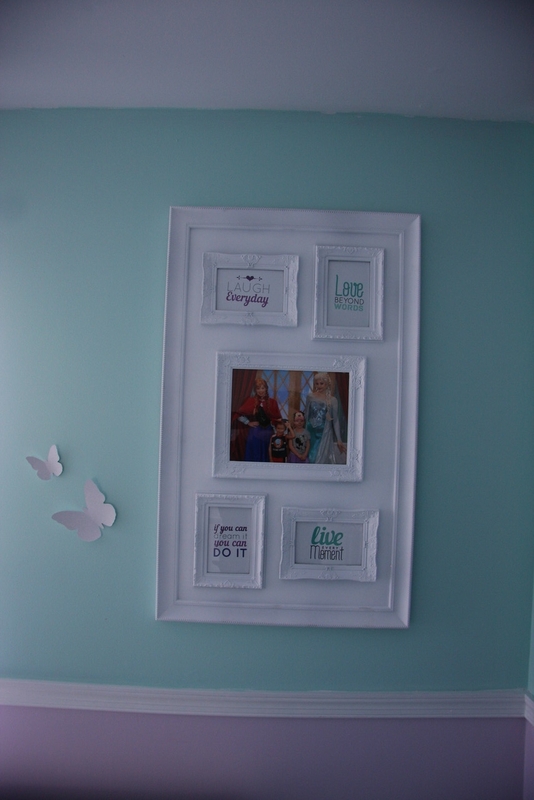 Tiffany, lead designer, donated the mirror she used as a child in hopes that Hope would love it as much as she did. Elsa costumes so Hope can feel like a real princess! John was almost as excited as Hope! She dressed up in her Elsa costume and serenaded the volunteers with "Let it Go". 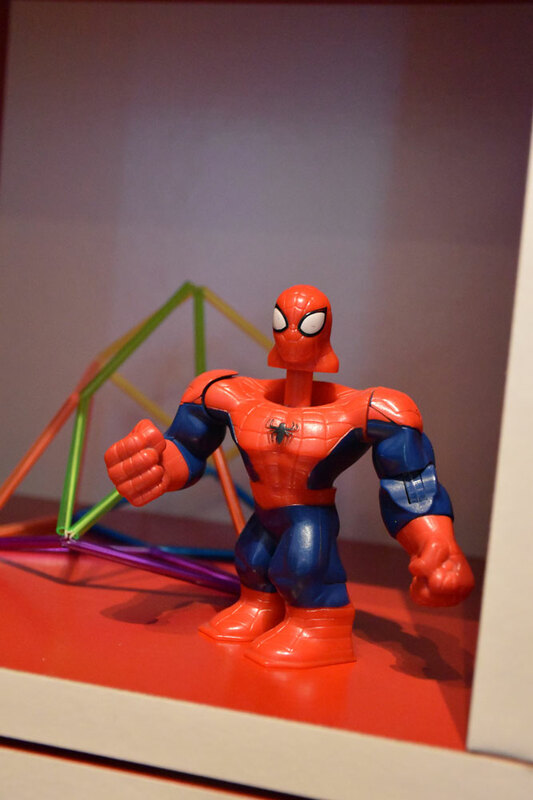 Seth is a strong 10-year-old boy who was born with a genetic bleeding disorder called severe hemophilia A—an incurable, life-threatening condition. 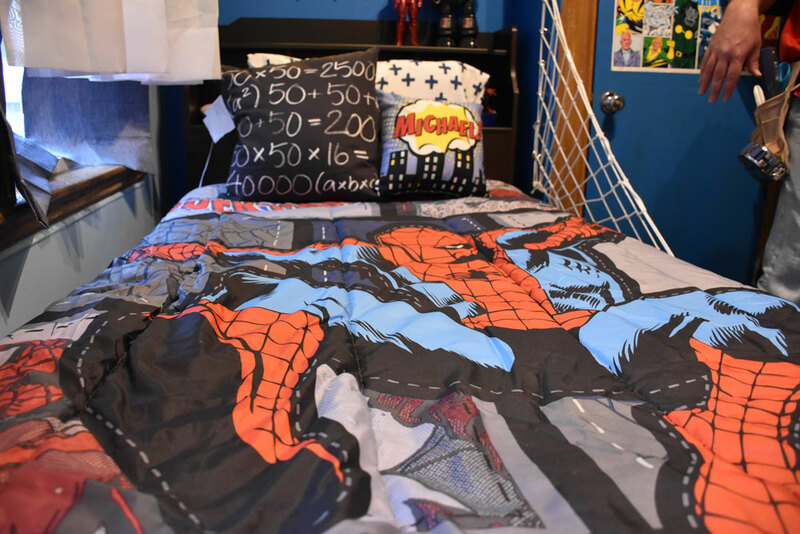 On August 22nd, 2015 Seth received a fun and functional space where he can receive medical treatments, catch up on schoolwork, rest and recover, and play with friends! 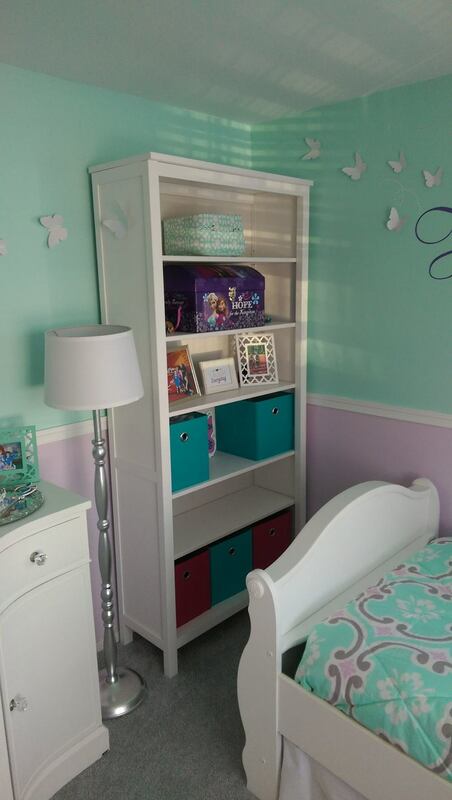 We designed the room with storage in mind. 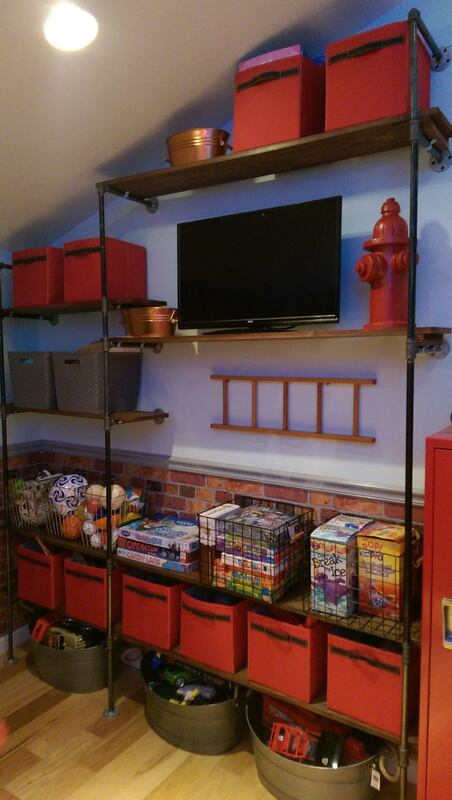 Plenty of pixel-inspired storage to hold toys, clothes, and supplies! Grass block and diamond ore hand painted baskets! Carpet donated by Lowe's #2610 and installed (in-kind) by ADF Flooring. New recessed lights donated and installed by RDH Electric. And new ceiling installed by Tilton-Northfield FF Local 4659 and Tilton-Northfield Firefighters Association. Thank you all for being awesome sponsors! Thank you Improvements Catalog for donating this adjustable table! This table will allow Seth to be tutored when he has to miss school. It'll also help Seth's mom prepare his medications. It will get plenty of use and really help the family! This new recliner is crucial for Seth's comfort during daily infusions. Thank you The Stitch Fairies for creating and donating these awesome Creeper Minecraft pillows! And thank you Able Sisters for creating and donating the awesome Grass Block cushion! New closet organization system to help organize the large amount of medical supplies that Seth needs daily. Thank you Wilson Graphics for donating this Block Chasm wall vinyl! We think he likes it! Seth's mom and sister see it for the first time! Seth gets right to work playing! Landyn Chappie is an adorable 4-year-old who loves whales. He also has Autism and experiences aggressive episodes. 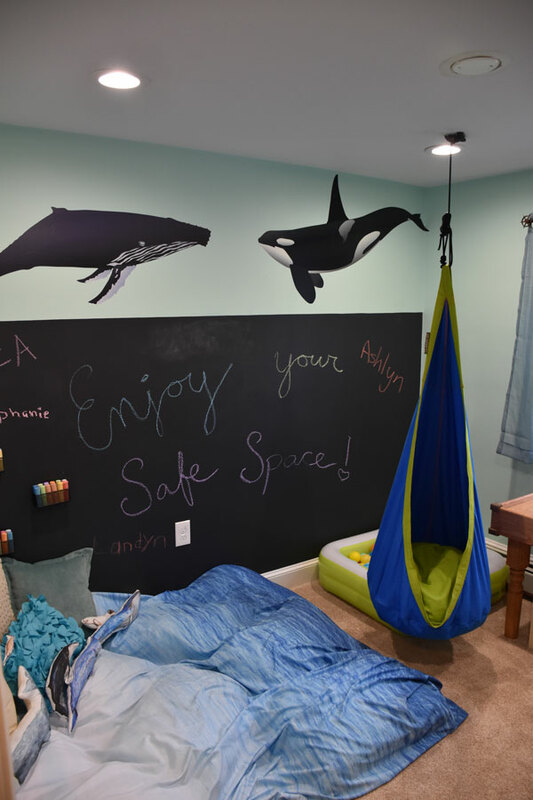 Corner Kingdoms partnered with Twin Coast Enterprises and their local Wendy's franchises to give Landyn a Safe Space which will help him cut down on stressors and cope. Shea is a care-free three-year-old who loves to sing and dance. She loves Disney princesses. She also has Autism manifesting in social issues and tends to isolate herself from others. 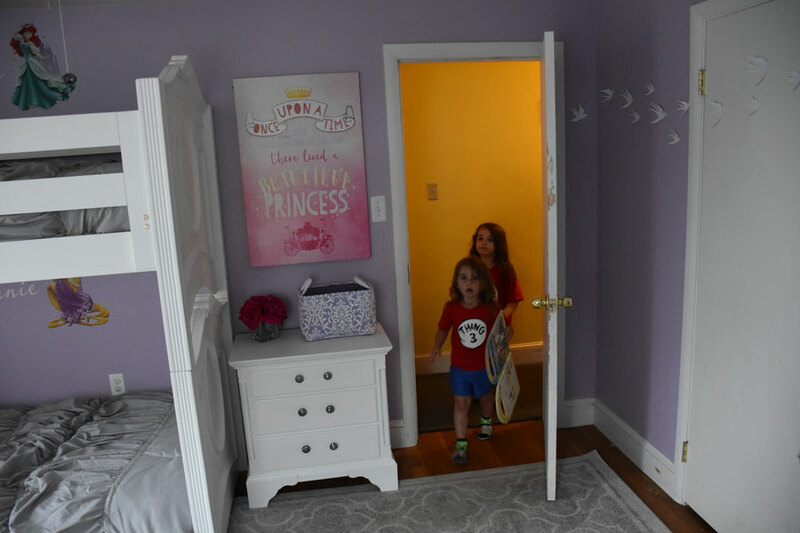 She shares a bedroom with her two sisters, and on June 4th and 5th 2016 we gave her a retreat. Max is the son of Corner Kingdom's founder Tiffany Blessing-Gagnon. This nursery was not funded by donations, but has become an "unofficial" Corner Kingdom. 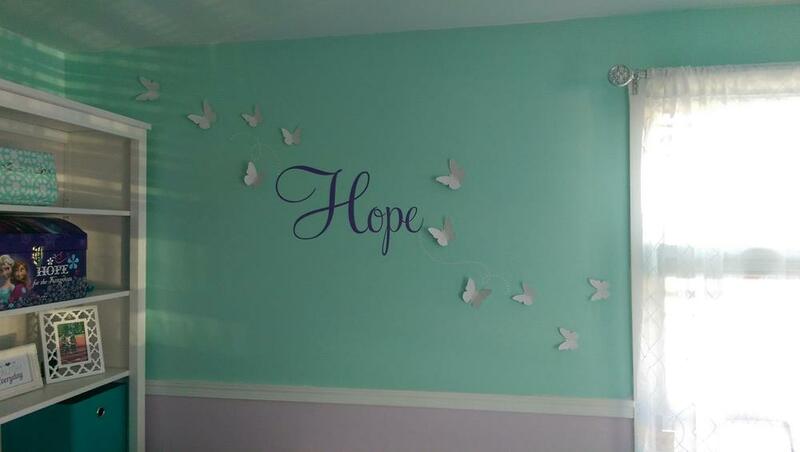 While in the process of completing Landyn and Shea's Safe Space project, Max was diagnosed with hypertonia -- a neurological disorder. He is also demonstrating other neurological issues. 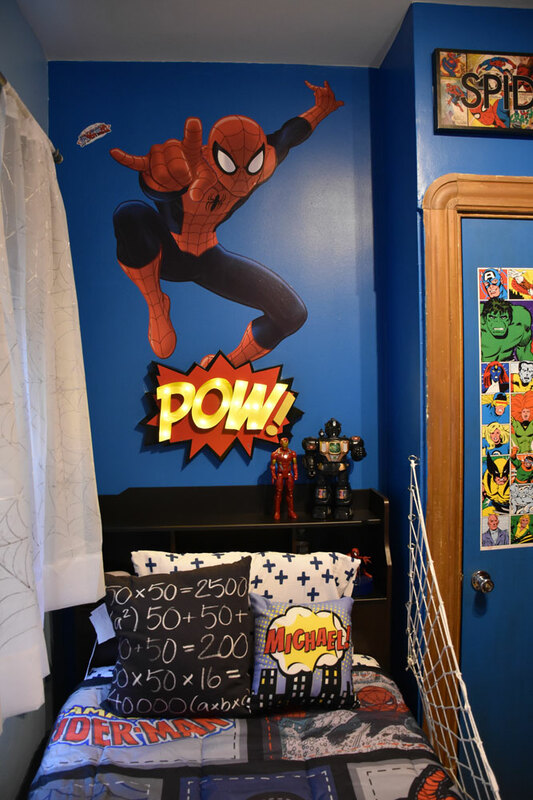 While Tiffany did not design Max's nursery with the knowledge that her son would have special needs, the room design is coincidentally perfect for him. Max will be delayed in walking on his own, and the wall-length window bench will help him cruise the entire room when he gets older. The signs of inspiration saying "Be Brave Little One" and "Run Wild my Child" are also surprisingly perfect. 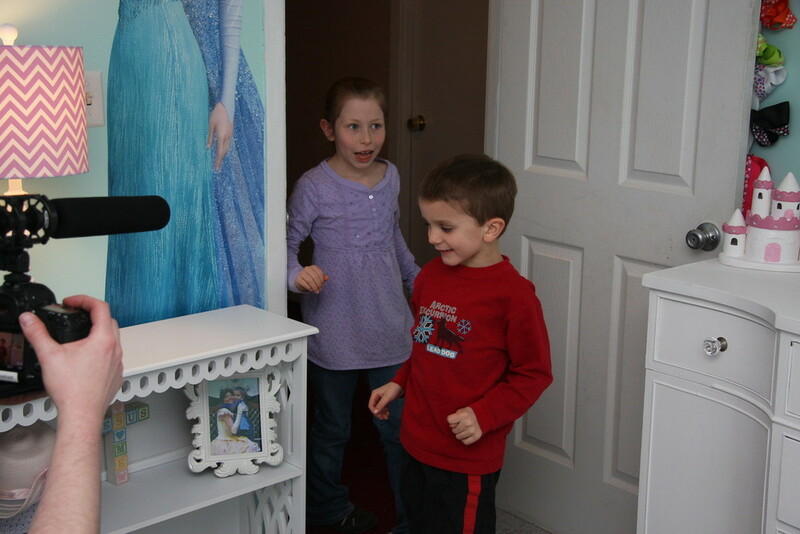 On November 19th, 2016 Sophia received a Dream Playroom! 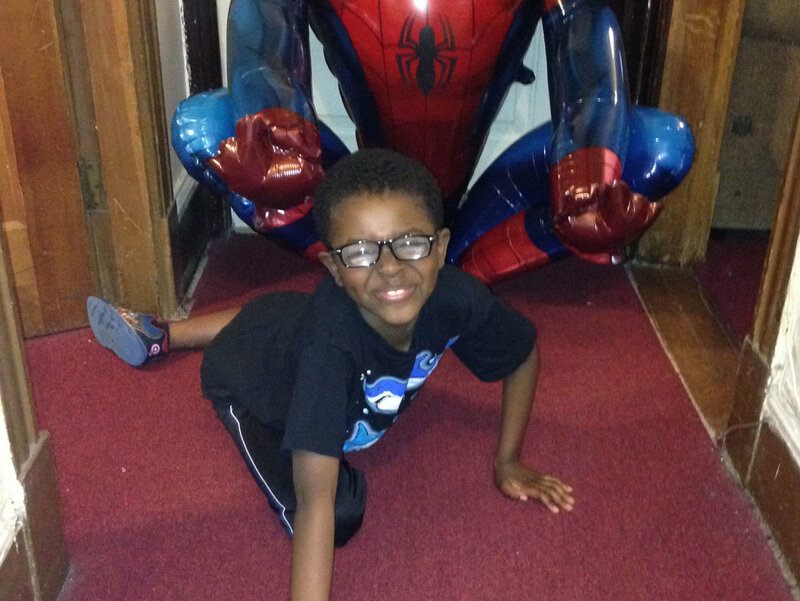 Michael is a bright, sweet 9-year-old boy who was born with congenital cataracts. This condition leaves him legally blind, and has caused some sensory and developmental delays. On April 22nd, 2017, Michael received a Corner Kingdom. Thank you LongChamps electric for installing the beautiful light fixture to increase visibility in this room! for donating vinyl print of Super Mike! TCKP depends on support from sponsors, donors, and volunteers. It's your help and generous donations that improve the lives of special families. Please help give our next King or Queen their own Corner Kingdom!